The dogs below are all full Hamilton or Tibetan, exept for Everglo Bo Yamak-San-Mo. In Bowie's pedigree there is only one ancestor down from the Shih Tzu lines, and it is at least 12 generations or more back. Presently Vesna Krajnc ( Tong-Hua Lhasa Apso Kennels in Slovenia) and I (Kyechu Lhasa Apso Kennels in the Netherlands) have established an excellent foundation of Tibetan/Hamilton Lhasa Apsos in Europe. We will all try to continue the old lines coming either from the Full/Straight Hamilton lines or the Tibetan lines. The Everglo lines have been continued since Gloria Fowler has been long retired. Entering dogs in a show should be enjoyable for all and that includes the dog, it’s owners/family and the person handling the dog. It is an excellent way for youth to learn good sportsmanship by getting involved in junior handling. It should be a day of pride where you have the opportunity to show off what you have accomplished in your breeding program. All dogs do not win. A lot can depend on the judge, your dog’s temperament that day, perhaps how well the dog is groomed, who is handling the dog and the list goes on. However, politics can be involved as well. Despite all of that, make showing a dog a family affair, have fun by packing a picnic lunch, watch and learn. Socialization is so important. Watch other breeds in the ring. Think about how different movement is for the various breeds. Study coat texture. Learn the environment of different dogs and how the breed has changed through the years. Showing dogs is a true learning and sharing experience and winning is not everything. 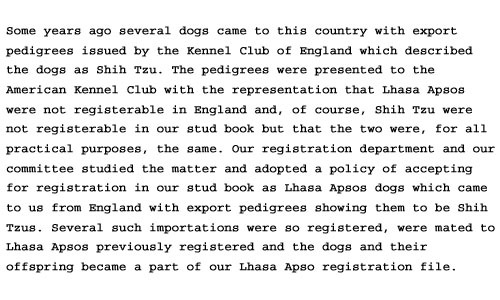 You can really benefit by learning to do other activities with your Lhasas. They can make excellent therapy dogs if raised properly and are well socialized. They make excellent Hearing Ear Dogs. One breeder demonstrated this with her most famous Hearing Ear Dog, Fluffy, who with his mistress Cathy Haas, a professor at Stanford University when they were featured on Animal Planet’s Lhasas: "Breed All About It" in 2001. Many of her dogs have also been visitors in nursing homes and placed in homes with disabled people and children. I’m proud to say that my logs live a true “doggy life”. This includes running around the house, walked outside five times a day, running in the forest, swimming, rolling in the mud, running with other dogs and cats and chewing on huge bones. YES, this does affect a dog’s coats, but for me the coat is not and should not be the determining factor whether a dog wins in the ring or not. What should be the ultimate goal is for the dog to be happy and carefree.